As the year races towards its end, a reflection on 2012 shows you some of the benefits ChemPubSoc Europe membership brings to you. In this third issue of the ChemPubSoc Europe newsletter, you'll also see new advantages in 2013. Looking back over 2012 and forward, we hope you'll agree that your society, through ChemPubSoc Europe, is working for you! Members of ChemPubSoc Europe societies have achieved international acclaim with their research and have been recognized by their societies. A selection of the top laureates who received their award in 2012 is highlighted here, together with links to recent articles in a ChemPubSoc Europe journal. 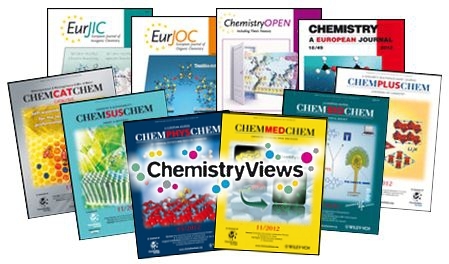 Want personal access to your favorite ChemPubSoc Europe journal? Members of ChemPubSoc Europe societies are eligible for ultralow personal subscriptions. For just €98 (plus VAT) per journal, you'll have online access for a whole year; for Chemistry - A European Journal that is over 17,000 pages! No institutional access to ChemPubSoc Europe journals? Ask your librarian to subscribe. ChemPubSoc Europe societies use the royalties from all our journals to support projects in their communities. For example, our Dutch colleagues at the KNCV award travel grants to members who have published in ChemPubSoc Europe journals. Your society will be able to tell you more about their activities and initiatives. One of our most established journals, the European Journal of Inorganic Chemistry, is instigating a new international award for young researchers. Watch out for the announcement in ChemistryViews and start thinking about who might be a worthy prizewinner! ChemPubSoc Europe representatives will meet in Göteborg, Sweden at the end of May to discuss strategies and future projects. If you have any comments or suggestions about our journals, please contact your society to ensure your voice is heard. Also in Chemistry, open-access-mandates are multiplying. ChemPubSoc Europe offers members a discount on publication rates in our journal ChemistryOpen, and for a fee all ChemPubSoc Europe journals offer you the choice of immediate free access through OnlineOpen as soon as your article is published. We would like to wish you a good finish to 2012 and an auspicious start in the New Year.